The idea of painting a room can sometimes be intimidating, but with these 5 easy steps, you'll see how simple it is to get great results. 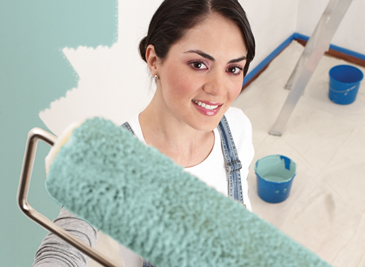 The correct sequence of steps is the key to giving any room a quick and refreshing paint makeover. Tip: Start with the ceiling first and then paint the walls. Remove dust, dirt, and grease spots (which can ruin a smooth finish) with water, a little mild dishwashing detergent, and a cellulose sponge. Rinse ceiling and walls with clean water to remove the soap residue. Beginning at the corner of the room, use a two-inch or 2.5-inch trim brush to "cut in," applying a three-inch strip of coating along the perimeter where the wall and the ceiling meet. Cut in a section at a time, alternating between cutting in and painting the ceiling to maintain a wet edge and prevent a visible line between the cut-in area and the rest of the ceiling. Before you begin painting the ceiling, remove excess paint on the roller by slowly rolling it back and forth over the ridges of the paint tray. Start painting near the corner of the room, blending the coating into the ceiling line painted previously. Paint across the width of the ceiling, rather than the length, and make sure to roll in a motion across your body, rather than along your body, to avoid straining your neck and back. Once your ceiling is dry, return to the spot where you began painting. Use a trim brush to carefully cut in along the wall-ceiling line. Extend out two to three inches from windows, doors, and moldings. Once you've cut in around an entire wall area, use a roller to fill in the field. For efficiency, start in the corner of a wall and roll on a three-by-three-foot W pattern, then fill it in without lifting the roller. Continue in sections until you're finished. Paint one wall at a time. Once the walls are completely dry, place painter's blue tape where the trim meets the wall. Paint the moldings, baseboard and the door and window frames with a two-inch angled brush. When painting your trim, paint the tops of the doors and windows first and work your way down so that you can remove any runs as you go. Paint your baseboards last.